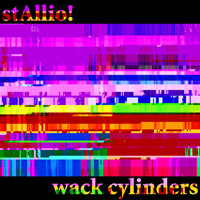 wack cylinders is a studio-based exploration of the improvisational live sound that i developed between 2002 and 2007. it is part one of a planned trilogy—part two, sword to your mother, is currently planned for sometime in 2009.
every sound on this album was sampled, much of it from live tv, and a lot of it was then run through various effects. because of how the material was collected, i honestly have no idea where a lot of the samples originally came from. an ????? indicates the existence of one or more samples of unknown origin. see the blog for more information. known sample sources: twilight zone, ????? known sample sources: jim fasset's "strange to your ears", bibleman, ????? known sample sources: freaked, ????? known sample sources: jim fasset's "strange to your ears", ????? known sample sources: mr wizard, crashbox, ????? known sample sources: silkwood, ????? known sample sources: sin city, ????? known sample sources: dragnet "blue boy" episode, ????? known sample sources: crashbox, superman returns, ????? known sample sources: transformers: armada, some show about tom selleck, ????? known sample sources: codename kids next door, ????? known sample sources: full frontal, ???? ?